Founded in 2013 Taloodles is a not for profit, registered charity that acquires and trains Therapy Dogs to assist in the care and treatment of people who have a disability that is attributable to one or more intellectual, cognitive, neurological, sensory or physical impairment. The temperament of the puppies chosen for Taloodles allow the puppies to commence their training at about 8 weeks of age, we obedience train them and teach them every day tasks like getting in and out of the car and expose them to lots of different situations in order to ensure that they are comfortable and relaxed at all times. It is a very special process that ends with the dogs being placed with their recipient family. We work towards placing the dogs with their recipient by the time they are 10-12 months of age so that the dog and recipient can develop a strong bond. Each Therapy Dog takes approximately 8-10 months to train and requires an investment of over $8,000. The number of dogs we can train and place is entirely dependent upon donations and fundraising that we undertake throughout the year. 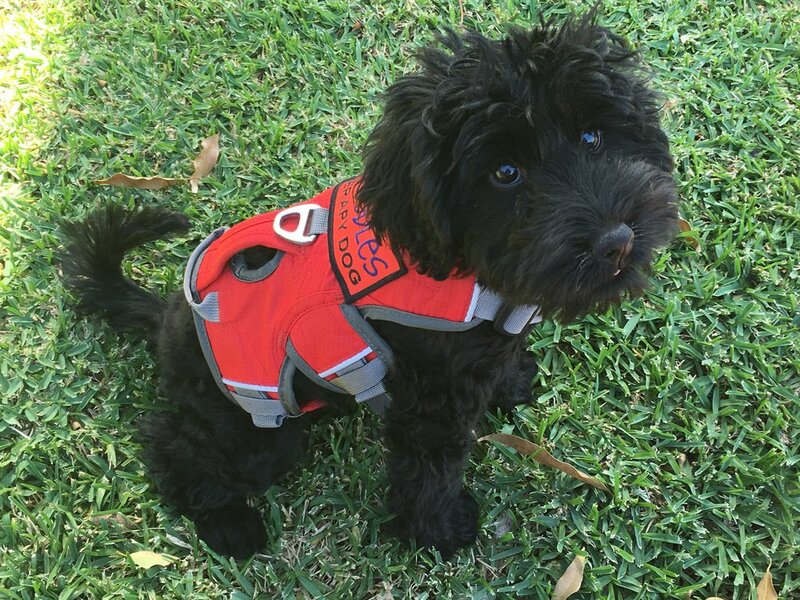 Taloodles provides these dogs to people with disabilities free of charge.